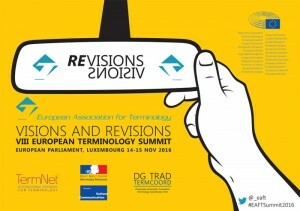 This year’s summit, organised by the European Association for Terminology (EAFT) in collaboration with TermCoord will be held in Luxembourg on 14-15th November 2016. The topic for this summit is: Visions and Revisions, celebrating 20 years of the EAFT and looking forward to the future of terminology. This entry was posted in Congresos y cursos. Bookmark the permalink.